This picture has been on the back of my bedroom door for almost a decade. Ryan drew it for me at his babysitter’s when he was 4 or 5. I believe the babysitter just told him “make a silly face” and this is what Ryan decided was a silly face. I absolutely love it. There are a bunch of reasons why this is my favourite picture of myself. 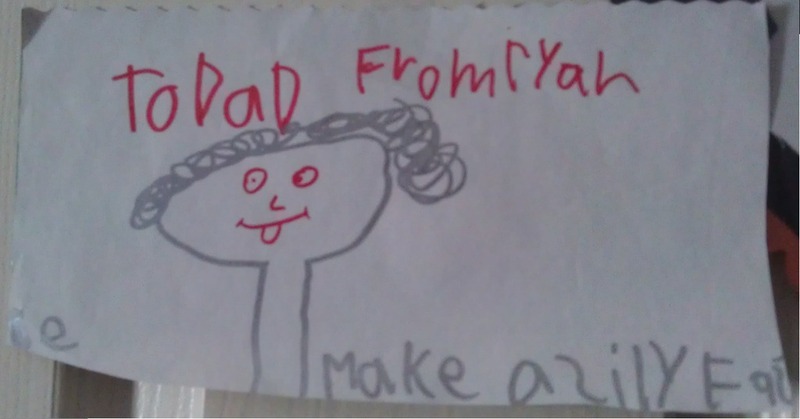 Obviously, the fact that my son made it for me makes it special. But it’s more than that. It’s the goofy eyes, the curly hair, the tongue sticking out, the two-foot long neck. It’s the fact that he used a shiny silver marker but did the face in red. It’s the lowercase ‘r’ in his name and the fact that the ‘n’ looks like an ‘h’. It’s the backwards ‘s’ in silly and the misspelling. It’s the fact that he ran out of room writing ‘face’ and decided to finish the word by wrapping around to the left side and putting the ‘e’ there. Everything about this picture is awesome and I smile every time I look at it. This entry was posted in Kids on January 20, 2014 by Graeme.